You may have heard about biodynamic viticulture, or seen reference to good days and apparently bad days for tasting wine and wondered about it. So we thought we would share the interesting story of Rudolph Steiner, the ideas behind biodynamic agriculture and to what extent it has been embraced by vineyards and wineries. -Loftus Hare’s account of Rudolf Steiner, 1922 Oxford Education Conference. It was not under the spell of a strange moon, but rather under the rays of the summer sun that Rudolph Steiner first preached to about sixty or so enthusiastic agriculturists in the summer of 1924. He proposed a bold, if unsettling theory of farming that involved astrology, esoteric principles, and the belief that the earth should be viewed as a living and breathing ecosystem (think ‘Avatar’!) Held in June of 1924 in Kobierzyce (then Koberwitz), Poland – Steiner delivered what some argue to be the world’s first course on biodynamic farming. Although to be sure, this appellation would only follow decades to come. Today, Steiner’s theories may be as controversial to the world of wine as Rasputin was to Russia under the reign of Tsar Nicholas the II. But just as the moon illuminates the vineyard at night, perhaps we too can glean a little more truth than controversy when it comes to the allure of biodynamic farming. Biodynamic viticulture shares similarities with organic viticulture but predates it by twenty years. Wine producers and consumers share the common desire for chemical-free grapes and harvests, not unreasonable by anyone’s standards. France, for example, has been one of the most prolific nations to adopt this attitude when it comes to their own viticulture. In fact, at the time of this writing, France boasts nearly 5,000 organic wine grape growers – representing a little over 9% of the nation’s vineyard surface. Red grapes on vine – does biodynamic viticulture make a difference? The bladder of the stag is connected . . . with the forces of the Cosmos. Nay, it is almost the image of the Cosmos. We thereby give the yarrow [root] the power quite essentially to enhance the forces it already possesses, to combine the sulphur with the other substances [in the soil]. The biodynamic calendar considers all viticultural processes from planting to harvest, even to wine tastings as well – while stressing an almost dogmatic-like stricture to rules laid out by its founder. Each day in the biodynamic calendar corresponds with one of the four Classical elements of Earth, Fire, Air and Water predating Plato. 1. Root Days – When the moon is in any of the zodiac earth signs. Don’t sip your Shiraz because, by extension, it may taste extra bitter. 2. Fruit Days – The moon is in fire signs as it corresponds to the zodiac. Believed to be the optimal day for tasting wine. 3. Flower Days – When the moon is in the air signs. Smell more jasmine in the bouquet of your torrontes? 4. Leaf Days – Good news or bad news? If you are a Scorpio and like extra gripping, bitter tannins in your American Cab, then go for it! Otherwise a good day for your vine to grow. In our post-Enlightenment era and with oenology an established science, can we hold biodynamic methods towards a standard of truth? One of the most famous studies to test biodynamic practices was published by the Swiss in 2002. The study spanned twenty-one years and appeared to have confirmed that biodynamic viticulture succeeded organic farming in positively affecting soil fertility. The study was, however, met with harsh criticism by Dr. Eric Stockstad, a microbiologist at the University of California at Davis. Stockstad pointed out that the Swiss group could only account for an “incredibly narrow range of ecological niches”. Also problematic, the study referenced supplementary material available online, but not cited within the Swiss paper itself. On the other hand, some winegrowers appreciate how biodynamics allows them to see their vineyard as an ecology. They also believe that this method allows them to produce a healthier, better product without having to input potentially harmful chemicals into their soil. Many respected wine producers have also found value to biodynamic practice, including , Domaine de la Romanée-Conti vineyard in Burgundy, Nicolas Joly of Château de la Roche-aux-Moines (and among the first to embrace BD ) and Michel Chapoutier in the Rhône valley, not to mention many New World wine producers as well. It is particularly noteworthy that many French winemakers have welcomed a relatively new method of production, in a culture that otherwise fiercely preserves its winemaking tradition. Moreover, biodynamics has even found its way into academia. The Universität Kassel in Germany has incorporated Steiner’s work into both the Department of Ecological Agricultural Sciences and their Department of Organic Agriculture and Plantry. Where Do the Stuffed Cow Horns Come In? Of course, any discussion of biodynamics would be remiss without mentioning a bit more about cow horns. You can of course find pictures of the bizarre practice easily online. Many pictures abound! Here is one from Stefano Lubiana on Flickr which was captured in autumn 2013 at Granton Vineyard in southern Tasmania. It shows the specially prepared cow horns for the production of horn manure (BD preparation 500). But the question above raises a somewhat more rhetorical one. What hurt does it do to endorse Steiner’s practices if there seem to be good results? Or, if the scientific breadth of literature wanes thin here, can we not acknowledge the good of pesticide free viticulture? Yes and no. This would be oversimplification, to say the least. Winemakers and consumers today remain fiercely polarized by these techniques. Proponents argue that, wacky methods aside, biodynamic wine ensures a measure of success, a quality product and more conscientious farming. So what if you have to stuff a cow horn with manure sometimes and bury it under the soil during the equinox? On the contrary, critics point out that this method is costly and impractical, if magical in thinking. 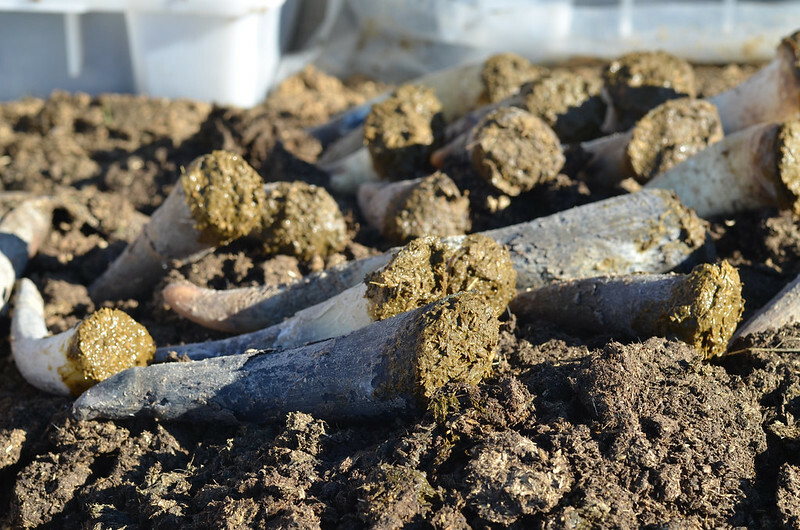 Consider the repercussions of digging up your buried cow horn when time comes to do so and the health of your vineyard. Other critics, include sommeliers who denote little difference in wine taste, to scientists who have yet to be impressed by a kernel of empirical evidence to support biodynamics as a legitimate practice. To this end, the Roman poet Martial said it best: “You will make the wine good by drinking it. If you are interested in having your own vineyard (winery) to embrace biodynamic viticulture, then you can view our portfolio of Bordeaux vineyards for sale. Properties range from a remarkable hobby vineyard to much larger commercial enterprises. Or you may just want to live in this beautiful region, surrounded by vineyards but without the desire to own one? In which case then please view our portfolio of Bordeaux residential properties for sale. Previous: Could Chateau Fauchey be the shape of future Bordeaux vineyard sales? Next:Dreaming Of Buying A Bordeaux Vineyard?